What's better than getting in a holistic work out than rounding it out with a healthy meal to follow? Nature Yoga Sanctuary in Oak Park now provides the nutritious meal everyone needs after a sweat sesh or those just looking for a new (and delicious) vegan spot in the city. After being open strictly as a yoga studio since 2004, Nature Yoga Sanctuary founder, Nicole Sopko, wanted to recreate a space not only for finding your balance but for eating healthy too! "We had been operating across the street from our current Oak Park location for 13 years as a yoga space and were looking to move into a different kind of space. The building across the street (where we are now located) came up for rent, but was more space than we needed for the yoga center," Sopko told us. With the bigger space, Sopko and her partner, Daniel Staackmann decided to add an all-vegan cafe which they officially opened in October 2017. In addition to being vegan for over 20 years, the two were already in the food service business with Staackmann's company, Upton's Naturals, a natural foods company with a focus on meat alternatives and vegan values. The pair also operate Upton's Breakroom in the West Town neighborhood which they started together five years ago. "Having that experience gave us the inspiration to add the cafe to the yoga center to create a space for people to socialize before/after class or to come in totally unrelated to the yoga business," Sopko said. The café is the very first all-vegan restaurant in the Oak Park neighborhood. Their menu offers a variety of sandwiches, salads, rice bowls, waffles and drinks that even non-vegans will enjoy! "We wanted to create a menu that had healthy options, but was not maybe stereotypically what someone would expect from a 'yoga cafe',” Sopko added. A few of our favorite healthy options are the Nature BLT and the Chickpea Salad Sandwich. 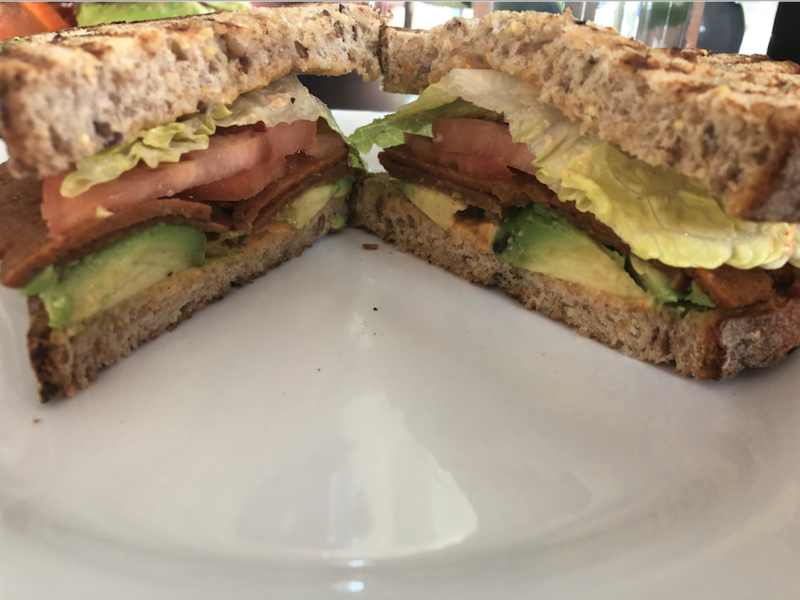 The collaborative relationship with Upton’s Naturals provides the café with their meat alternatives in the Nature BLT which features a bacon seitan that tastes like bacon but without the grease and unhealthy stuff! The thick-sliced multigrain bread sandwiches the seitan in addition to fresh romaine lettuce, tomatoes, avocado and slicked with a creatively subtle gochujang aioli. 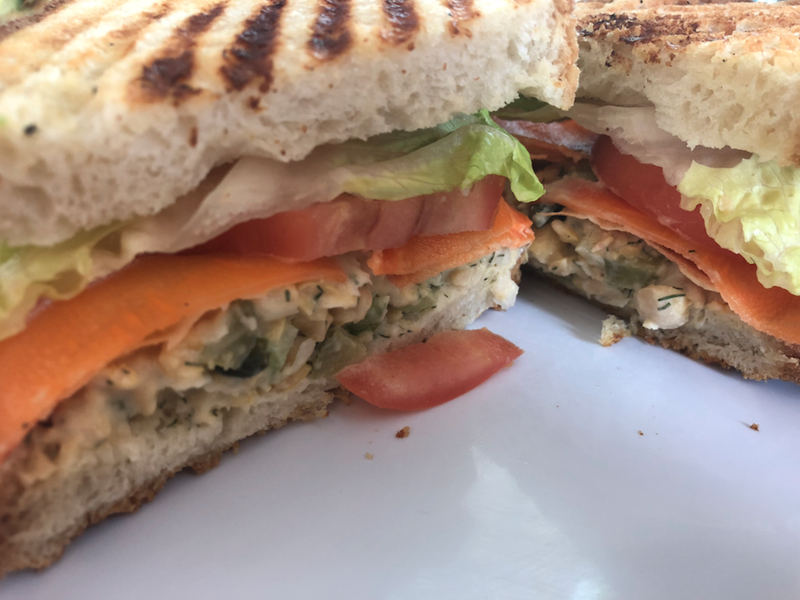 The Chickpea Salad Sandwich features a blend of chickpea, pickle and wakame seaweed salad and is topped with lettuce, carrot ribbons, and tomato on a thick-sliced sea salt and olive oil coated ciabatta. 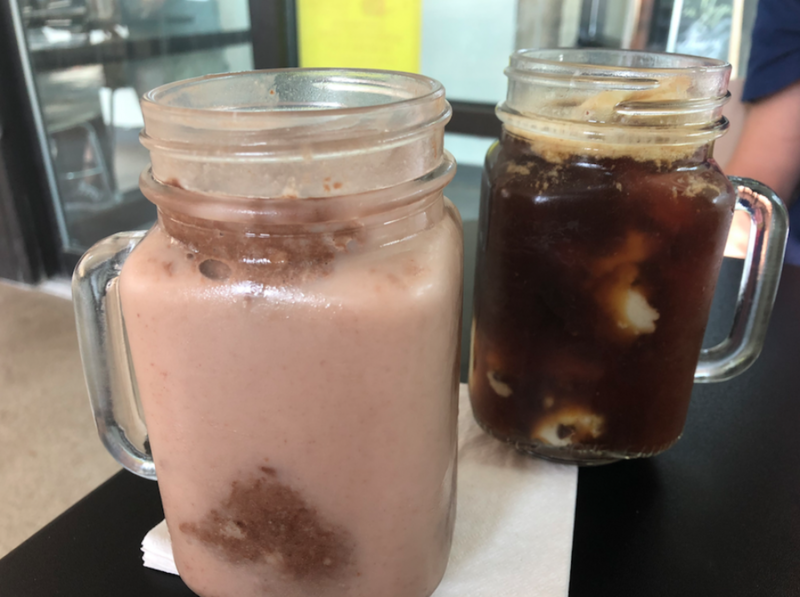 The café also offers a delicious dessert menu featuring their unbelievably delectable soy ice cream sourced from local distributor, Temptation. With rotating ice cream flavors, guests can get scoops, banana splits, shakes or floats to round out their vegan meal. The float combo we can’t stop drooling over is the Double Chocolate Chip Cookie Dough with Chai Tea from Milwaukee's Rishi Tea and Botanicals. The Mint Chip with Cold Brew is also worth trying for a nice pick-me-up before or after your yoga sesh. With two locations in the city (Oak Park and Wicker Park), the Nature Yoga Sanctuary Café is exclusive to the Oak Park location and is open 9AM to 7:30PM Tuesday through Friday and 8:30AM to 4:30PM on the weekends. For yoga classes and hours at either location as well as a look at the Oak Park café menu, visit http://www.natureyoga.com/. Soy Ice Cream Floats are worth the trip!